click image for close-up American illustrator Howard Pyle, illustrator of many historical and adventure stories for periodicals, created this depiction of a slave auction in New Amsterdam (later to be renamed New York). New Amsterdam, a town on the tip of Manhattan Island within the Dutch colony of New Netherland, saw a sudden influx of African slave labor in 1655. The Dutch had been involved with the African slave trade for some time, having seized Portugal's Elmina Castle along the West African coast about two decades earlier. Soon after gaining control of the slave factory they were shipping 2,500 slaves across the Atlantic each year. Many of these slaves were sent to Brazil, another territory the Dutch had seized from Portugal. But this control of Brazil was short-lived. The Dutch were still active participants in the slave trade when they lost control of Brazil in 1654. Now they directed their attention to the colony of New Netherland. The colony already had black slaves; these had generally come by way of the Caribbean Islands. In 1655, the first large shipment of slaves directly from Africa arrived at New Amsterdam. 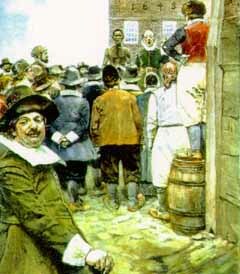 In 1664 the English seized New Netherland, including the town of New Amsterdam. They renamed the colony New York. At the time there were roughly 500 Dutch-speaking blacks in the colony.